June 29, the Investigation Committee of Russia declared that the case of the rioting football fans on Manezh Square has not been submitted to the court, but is at the final stages of investigation. On the same day, a State Duma statement stated that a battle will unfold against racism and xenophobia at sports stadiums. Sports fans’ extremism has led deputies to the idea that playing fields should be declared “zones of increased risk.” However Russia, itself, could very well turn into such a zone. The country was just recently given the right to host the 2018 FIFA World Cup, but in this situation may possibly lose it. This means that the country’s prestige is at stake, and so is that of the head of the Government, Vladimir Putin. The football industry, which is finally turning into a serious business, could also suffer. June 29, the Investigation Committee of Russia announced that work on the case of the riots on the Manezh Square remains incomplete, despite assurances provided by the lawyers of certain individuals accused of organizing the December 11, 2010 mass riots. However, it is, indeed, at the final procedural stage. And the two main defendants, Igor Berezyuk and Ilya Kubrakov, are already becoming familiar with the case. The case of the death of football fan Yegor Sviridov, whose death became the official reason for public outrage, is also being prepared for court hearings. Xenophobia, meanwhile, has become a relevant topic in the sports field after the recent scandal involving one of the players of the Anzhi club, Roberto Carlos. Recently, during a Premier League game in Samara, a banana was thrown at a dark-skinned player. Roberto Carlos left the stadium in tears. All the football players, playing in that match found the banana throwing to be offensive and extremist – especially considering the fact that the player had become the object of racist attacks a number of times. The shockingly high level of extremism at stadiums has attracted the attention of all global news agencies, which showed details of the unpleasant episode. And only then did the problem attract the attention of the State Duma deputies. After all, in seven years’ time, in 2018, Russia will host the FIFA World Cup. Meanwhile, the country may be stripped of this right due to these types of scandalous actions, especially considering that there will be those in global football circles who will want to do that. The nationalists’ outrageous behavior at the stadiums threatens both the security of sporting events and the country’s global image – which is already not the best. Deputy Valery Draganov, former vice president of the Russian Football Union, suggested tightening control over football matches through legislation. He put forward the idea of declaring football fields “zones of increased risk”, and believes it is necessary to equip sporting arenas with video cameras, which will not only record the players on the field but also fans in the stands and within the stadium facilities. The deputy’s ideas are criticized in the Sova Center for Information and Analysis, which deals with problems of extremism. Control and video cameras are already present at sporting arenas. But practice shows that these measures are ineffective, especially because, until recently, the fight against racist behavior during football games was formal. “Law enforcers were mostly concerned that fans did not throw chairs at one-another. That’s all,” says Sova expert Vera Alperovich. He is confident that legislative measures against extremism in sporting arenas are one of the components of a comprehensive fight against the problem: “We need to conduct preventative measures, including with the fans themselves. But we also need to be engaged in a struggle against xenophobia in general.” At the same time, the expert acknowledges that these efforts could simply alleviate the problem, but not eliminate it altogether. Meanwhile, the situation is not unique to Russia. About 20 years ago, fans in Great Britain were getting out of control. As a result, the great English football began to suffer. 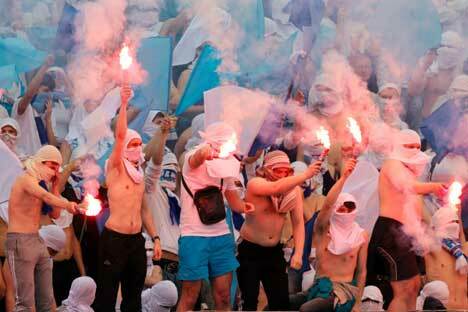 Authorities struggled against the fans’ extremism. Not against all of the fans, but against individuals. They were all identified, and it turned out that there were no more than 500 of these people in the entire country. Now, their photos are displayed at every stadium, and they are not allowed to enter. Neither do they have the right to leave the country for international matches. Our police ought to learn by this example, and not put pressure on all football fans indiscriminately, but identify extremists, even if they do so with the help of video cameras and fans, who value their favorite team more than ethnic preferences.